Normally the winter is my most productive time for yarn crafts. It’s so nice to sit inside under a blanket and knit a warm sweater or a pair of socks that I’ll get to wear (or give!) as soon as they’re finished. This winter I moved, and it has totally sapped my energy. I finally got around to finishing a project this past weekend, and it’s suddenly too warm to wear it! That’s OK – it’ll be back to below freezing next week. Anyway, in the interest of sparking some creativity (for myself and for the reader), here’s my new sweater. I’ll be wearing it next week, when the snow returns. You can view the color work chart here. What have you been up to this winter? Send me an email to share your current projects. This entry was posted in Uncategorized on February 19, 2014 by admin. The ultimate goal of this series on variegated yarn is to provide helpful information when deciding how to pair variegated yarn with a pattern. 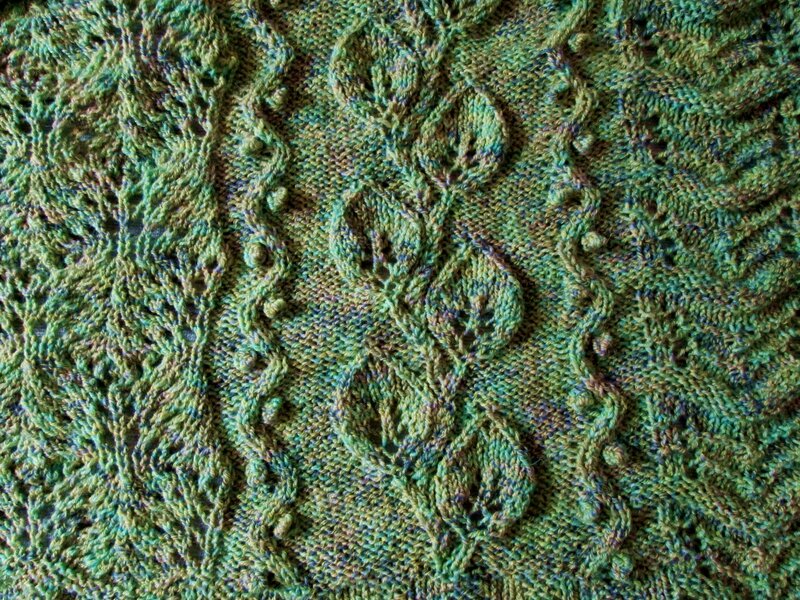 In general, it is best to use variegated yarn with projects that make use of simpler stitches – you can use busy yarn or busy stitch work, but you shouldn’t use both. In addition to this guideline, you should take into account the type of variegated yarn (i.e. short patterning, long patterning, self striping, etc., as discussed in the last post) and the shaping (or lack thereof) in the pattern. 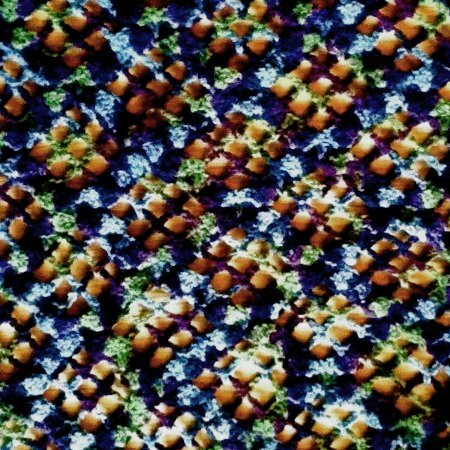 A pattern with little or no shaping (such as increases and decreases) will result in regular color patterning just like the swatches in the previous posts. 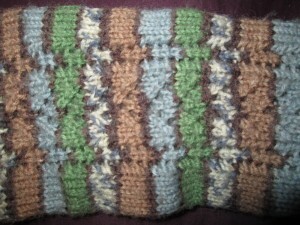 A pattern with lots of shaping will result in a more random assortment of color patterning. 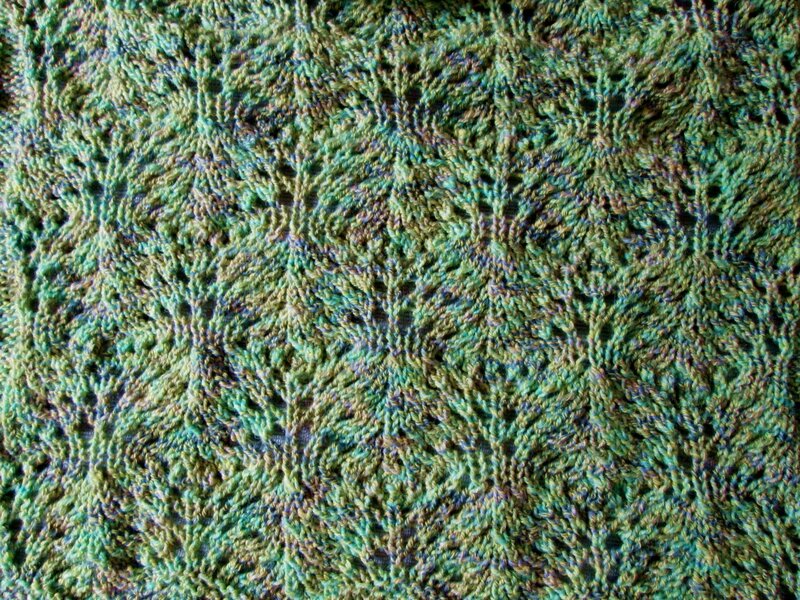 The following examples show cases where I believe I have successfully coupled variegated yarn and a pattern. This seat cushion uses short patterning variegated yarn and no shaping. 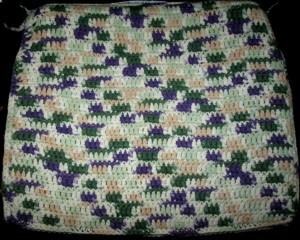 This project is crocheted back and forth in rows, with one row of double crochet followed by a row of single crochet. Because the double crochet rows are wider, their colors stand out, and a diagonal striped pattern is visible (instead of the zigzag pattern normally expected when working back and forth in rows). 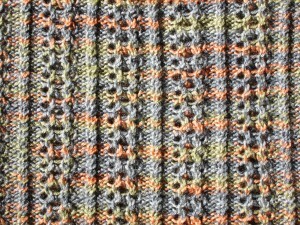 The next example shows a portion of a baby blanket made with short patterning variegated yarn. The blanket itself is square, so there is no shaping. 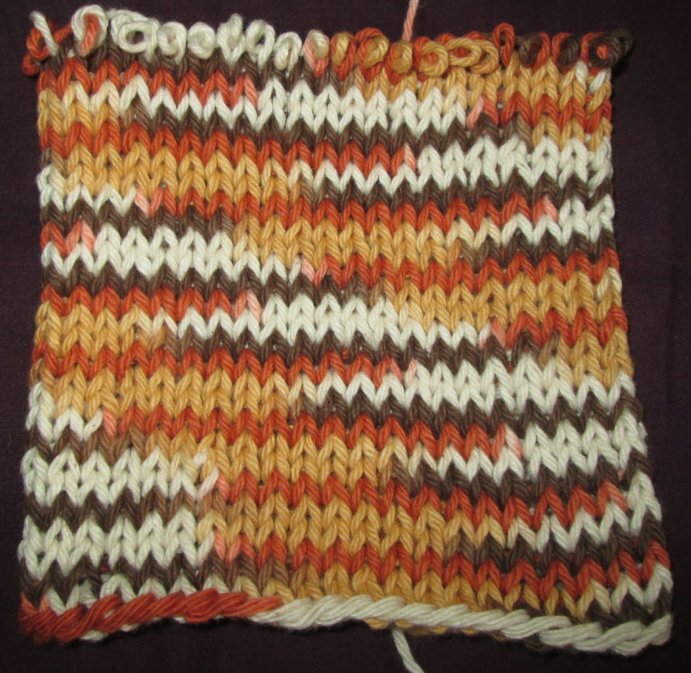 However, each row uses a different amount of closed and open work than the adjacent rows, so the colors form a more random pattern instead of the usual zigzag expected of this yarn. 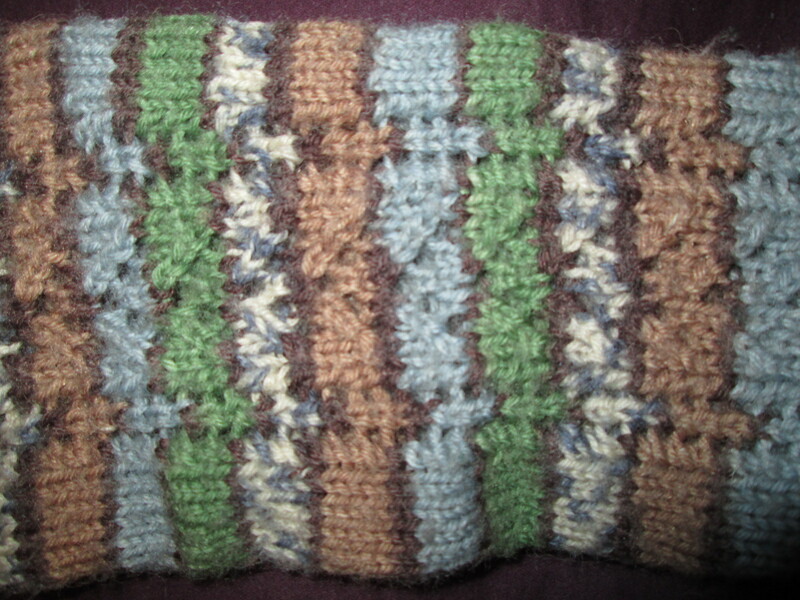 These socks are made with self-striping yarn. A little openwork patterning is done on the sides. 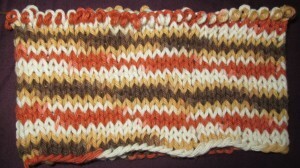 In the last example, self-striping yarn is used in a pattern that requires a lot of shaping. I’m developing the beret seen below as a way to use self-striping yarn to get more than just stripes. These are just some of the ways that I have used variegated yarn. Over the years I have made many mistakes when forcing a yarn I love to go with a pattern I love even if the two don’t go together. Spending time thinking about how the colors will play out (using the basic principle presented in the previous posts) and, yes, making swatches are important steps in determining if you have the right yarn for the project – or the right project for the yarn. 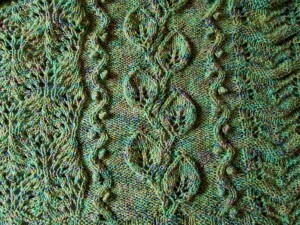 What are your success stories in using variegated yarn? I’d love to see and hear about your variegated yarn projects! 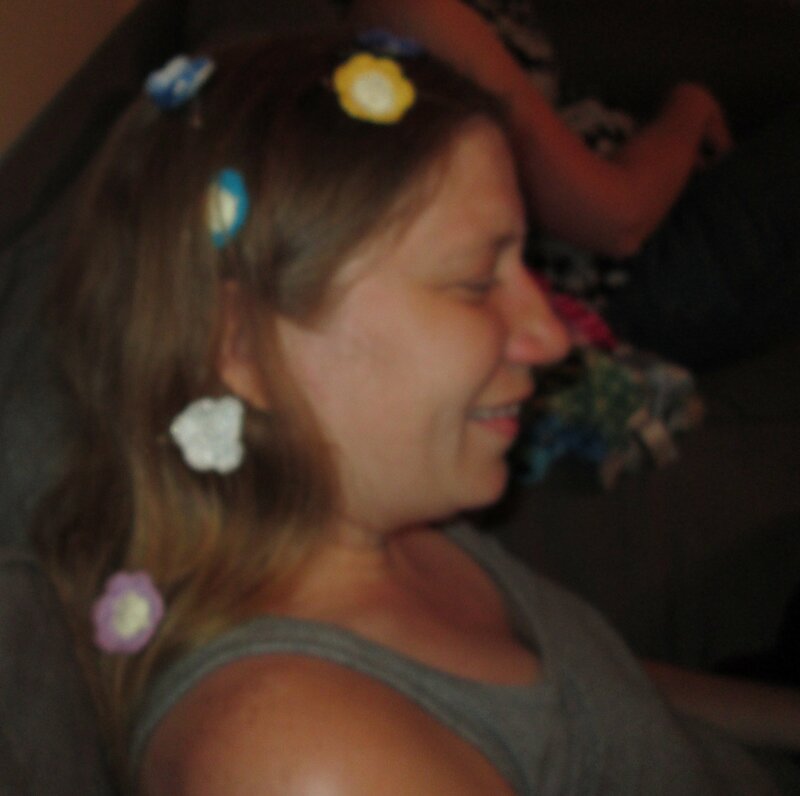 This entry was posted in Uncategorized, variegated yarn on November 5, 2013 by admin. 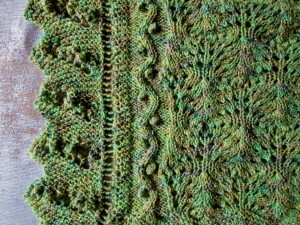 This yarn has what we could call ‘short patterning’. The entire cycle of TBBTWOOW repeats itself rather quickly. 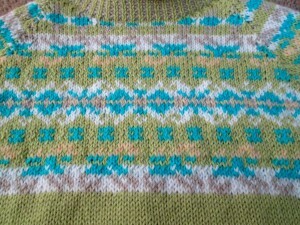 In the sample swatches, the pattern starts over every 1 1/2 – 2 rows. If we used this yarn for a bigger project, the color pattern would repeat within the same row. All of these yarns will produce zigzag patterning or diagonal striped patterning, depending on whether you work in rows or in the round. This yarn will not produce zigzag or diagonal striped patterning. It will produce stripes, whether it is worked in the round or in rows. The width of the stripe depends on how wide the work is. For example, if you used this yarn to make a sweater, the body of the sweater will have narrower stripes than the sleeves. It is fairly easy to tell the difference between short patterning and long patterning variegated yarn just by looking at it in the skein. For short patterning yarns, the adjacent strands of yarn will be different colors, and for long patterning yarn, there will be sections of strands of the same color. Finally, there is also ‘self-striping’ yarn. This is different from the ‘long patterning’ yarn in that it is generally more intricate and meant to be used for certain projects such as socks. Self-striping yarn will generally be advertised as such. 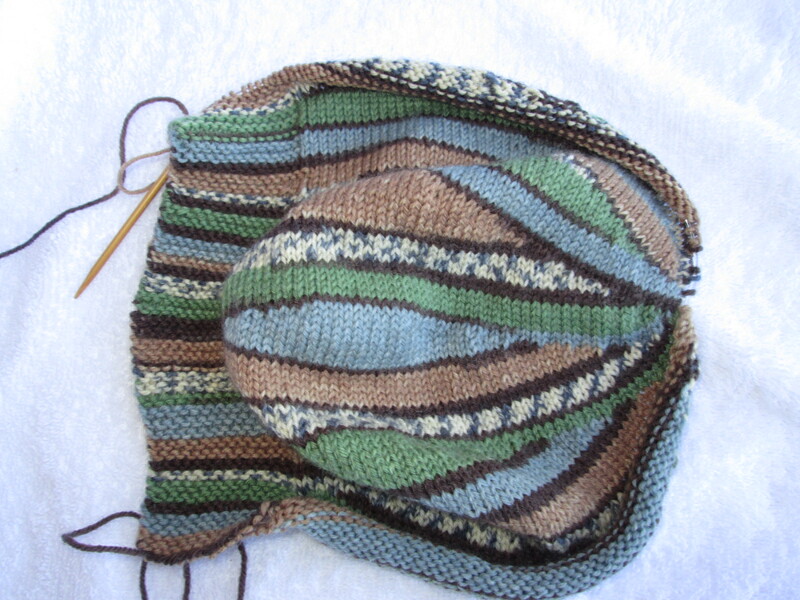 It can be tricky to use self-striping yarn for projects other than ones it is intended for. This entry was posted in Uncategorized, variegated yarn and tagged tutorial, yarn on October 9, 2013 by admin. 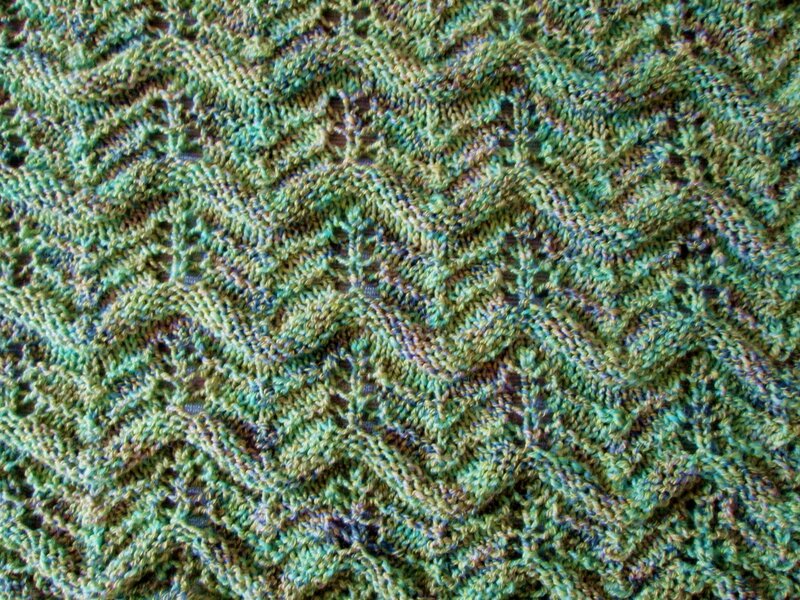 In the last post, we saw how working back and forth in rows with variegated yarn will lead to a zigzag pattern. The length of the rows determines how the colors work together in the zigzag pattern. 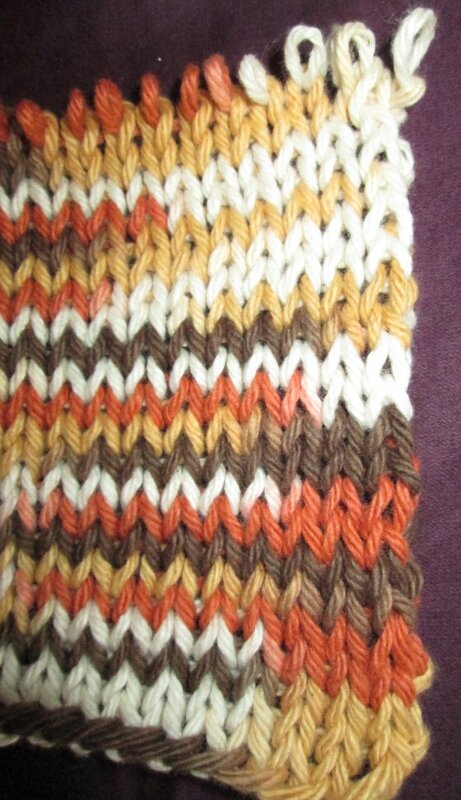 Another trait of variegated yarn worked in rows is the ‘double up effect’, where you get the same color in two consecutive rows at the edge. If your rows are long enough, you will also see the double up effect in the middle of your work. Working in the round produces a different type of pattern. There is no double up effect and the colors form diagonal stripes that go one way only. They zig, but they don’t zag. 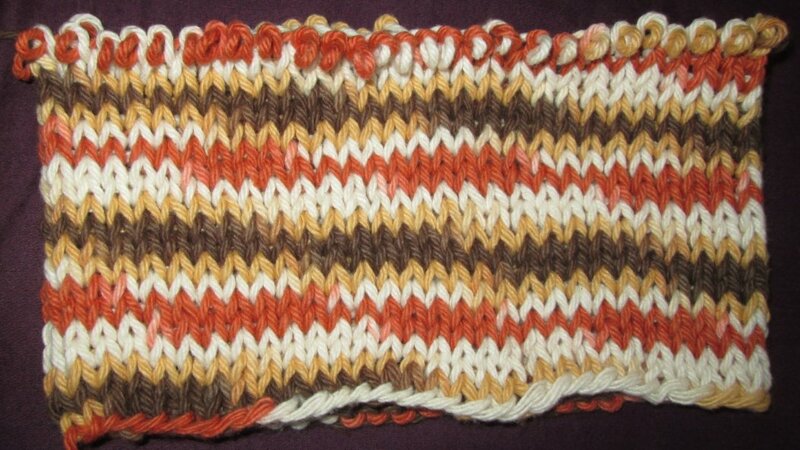 In this example, the orange and tan pair up and the brown and white pair up to form diagonal stripes. Remember the color schema for this yarn: TBBTWOOW. You can see that orange is in the same position with respect to tan as brown is to white. In the next example, made with longer rows, we get single color diagonal stripes. If you pick a single column and move up, the rows follow the color schema exactly – white, orange, white, tan, brown, tan. Working back and forth in rows produces a zigzag pattern. Working in the round produces a diagonal stripe pattern. 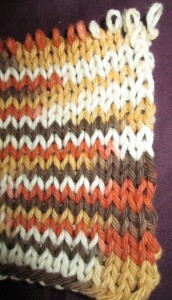 The length of the row/round determines how the zigzag or stripe pattern works. You may need to make a swatch that is the actual length of your project in order to determine if you will like how the variegated yarn works with that project. If you don’t like what you get, you may be able to significantly alter it by lengthening or shortening the rows by a couple of stitches. In order to visualize how the colors will come together in the zigzag or stripe pattern, it is useful to identify the color schema. Increases or decreases will change the pattern (more on this in a bit). 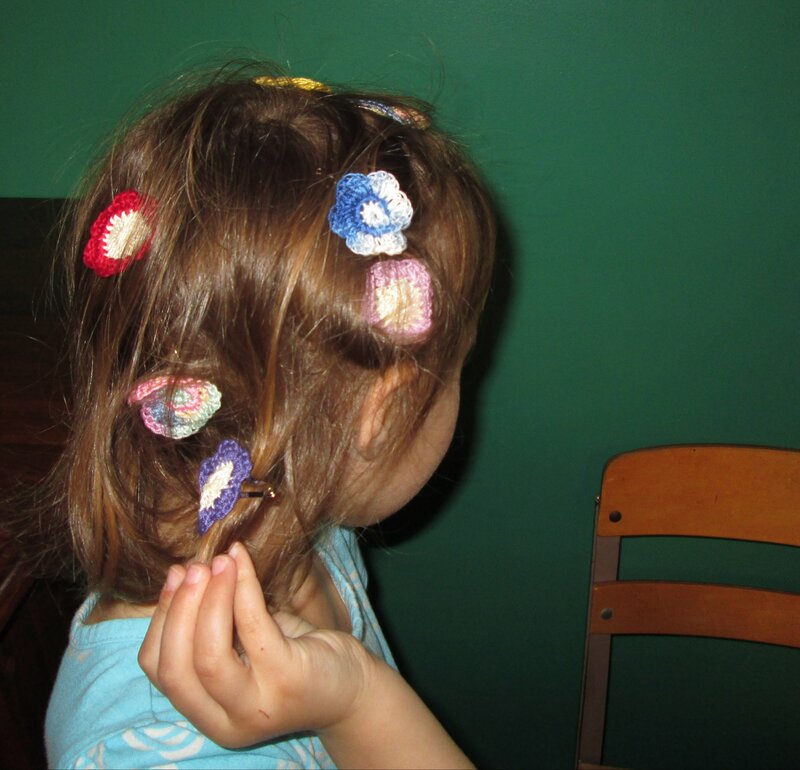 This entry was posted in Uncategorized, variegated yarn and tagged tutorial, yarn on July 16, 2013 by admin. Man, I’m a sucker for some variegated yarn. It can look so nice in the skein. All the colors look fantastic together – and I want all those colors in my project. The possibilities seem endless. But they’re not. That’s the problem with variegated yarn – what you see on the skein is not what you will see in your knitting and crocheting. Furthermore, you have very little control over how the colors will play out in your work. I have abandoned many a project with variegated yarn due to being unhappy with how the colors of the yarn work together in that particular pattern. The trick to effectively using variegated yarn is to carefully plan how to use it with your project. This is just like making a swatch – it takes time up front but saves you time in the end. 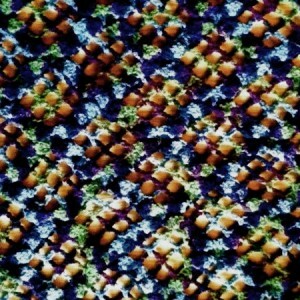 Unless it’s hand dyed, variegated yarn is made with a repeating pattern. 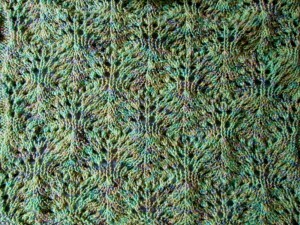 The yarn below has a very simple pattern. If you follow from the bottom up, you can see that there is a longer section of brown, a shorter section of tan, a shorter section of white, a longer section of orange, a shorter section of white, a shorter section of tan, and repeat. Basically, there are two main parts – one long section of brown surrounded by short sections of tan and one long section of orange surrounded by short sections of white. We could abbreviate this as TBBTWOOW. The rigidity and simplicity of this pattern has consequences for how it will work up. Notice how each color section zigzags back and forth. The orange and brown, which are opposite each other in the TBBTWOOW color scheme, are also opposite each other in the zigzag pattern. the tan and white form a less discernible zigzagging pattern in the background. 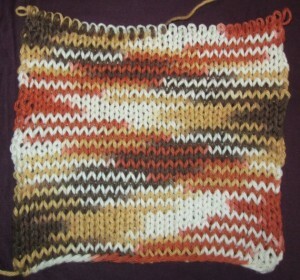 If you do not do any increases or decreases, this pattern will repeat just like this for the full length of your work. 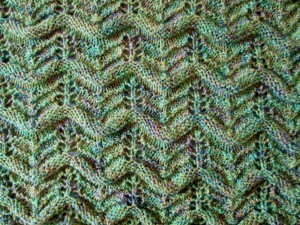 When working in rows with variegated yarn, the edge of the rows looks different from the center. In the detail below, you see that, at the edge, there are two consecutive rows of the same color, but that this ends as you move further into the center. This is due to the fact that when you end one row you are unlikely to end right at the point of a color change, so of course you begin the next row with the same color. 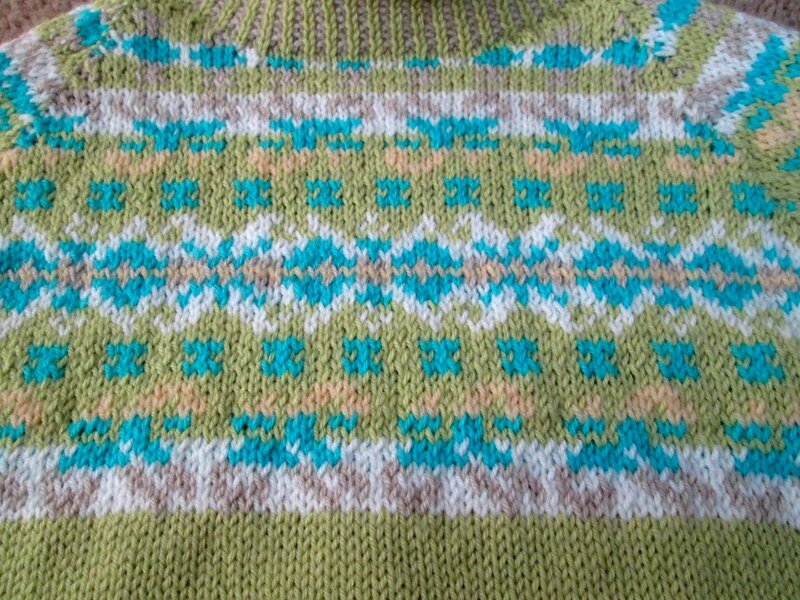 It doesn’t matter how many stitches you have in a row or even if you do increases and decreases – you will always get this effect when working in rows with variegated yarn. Sections 1, 3, 5, and 7 have this double color effect. You can even see that opposite colors (remember the TBBTWOOW schema) occur in the same row in sections 1 and 5 and in sections 3 and 7. For example, wherever you see brown in section 1, you see orange in the same row in section 5. Wherever you see white in section 3, you see tan in section 7. 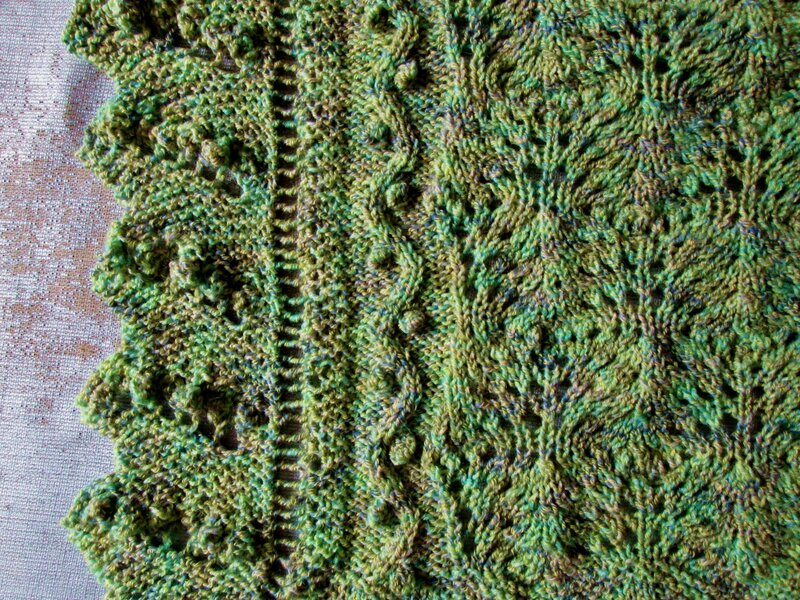 As you become more familiar with these patterns, it will be easier to judge from the beginning if you have the right variegated yarn for the project. 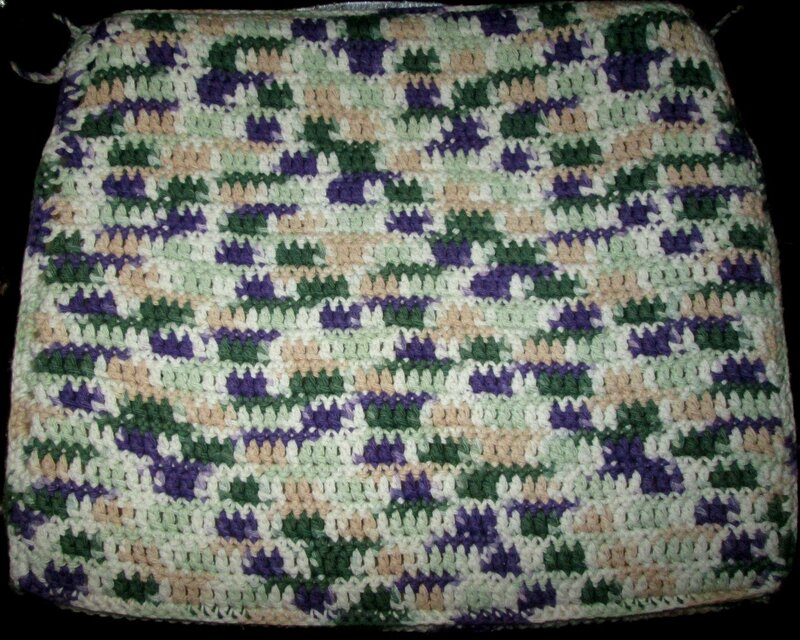 This entry was posted in Uncategorized, variegated yarn and tagged tutorial, yarn on July 10, 2013 by admin. 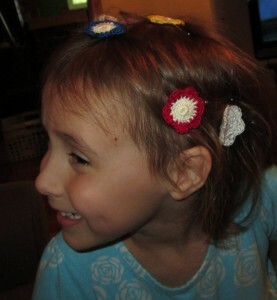 I’ve been working on some cute hair clips for girls to sell on etsy. 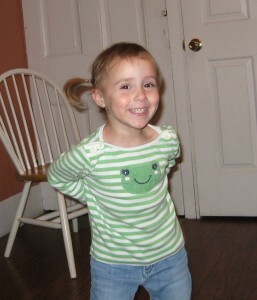 The trouble with accessories for kids is that you need pictures of actual kids wearing them. I had to find me some kids. who is pretty much as strong-willed as I am. I knew I had my work cut out for me if I wanted to get professional looking pictures that showcased my products. At first Ella was not interested in my hair clips. Then she was very interested. She got everyone to join in the fun. 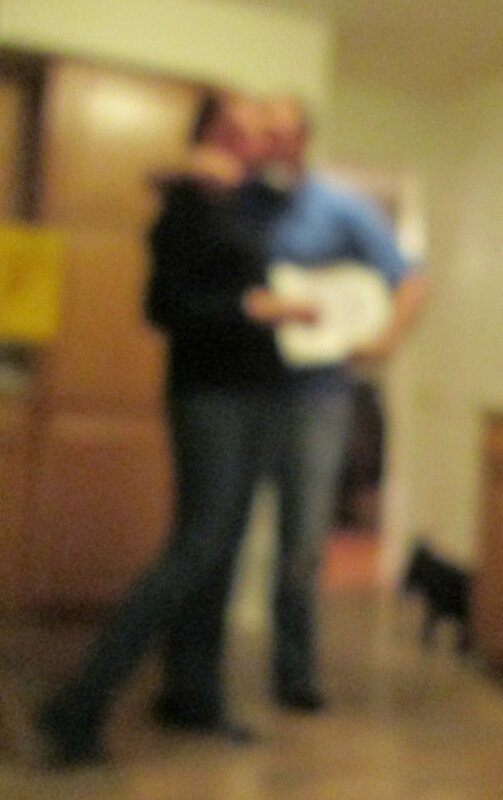 In the end, this was the best picture I got. 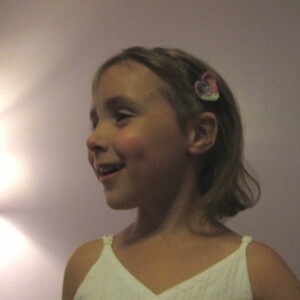 I don’t know if it’s what I need to sell my product, but it’s pretty darn cute! Look at that smile! I guess I’ll just have to spend more time with Ella, Jenny, and Pat in order to get some more pictures. 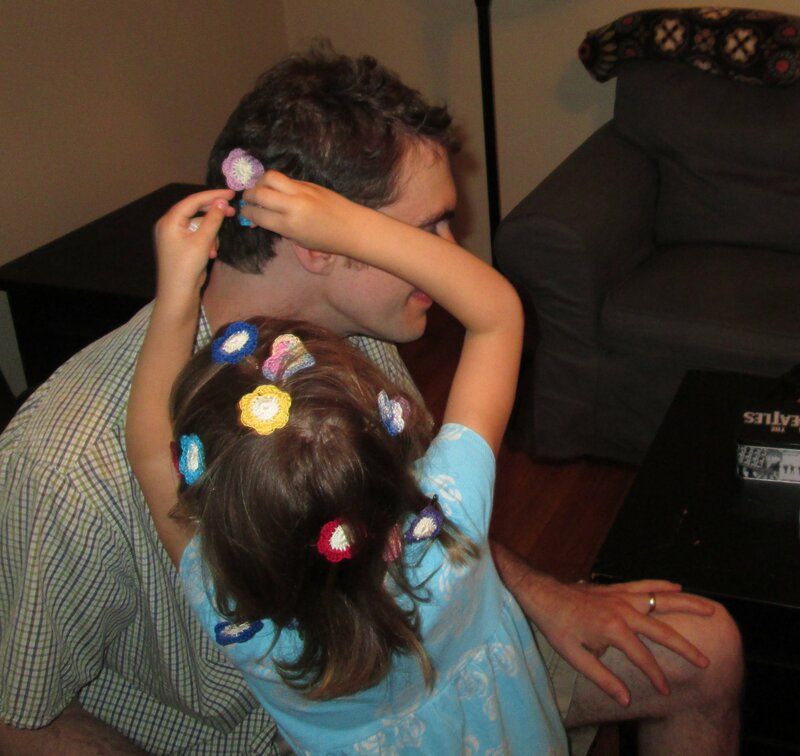 Oh, and, parents, Ella spent a good hour playing with these hair clips, so they’re more than just an accessory – they’re a toy! This entry was posted in Uncategorized on May 30, 2013 by admin. I’ve been working on a big project that I’ve been wanting to do for a long time – one of those wrap cardigans that is just a big rectangle with holes for the arms, so the sides fall down in waves. Here’s an example. All of the panels except the leaf panel are standard designs found in many large pattern books. I knew I wanted a embossed leaf panel to run along the waistline, but I couldn’t find the right one, so I had to write my own. 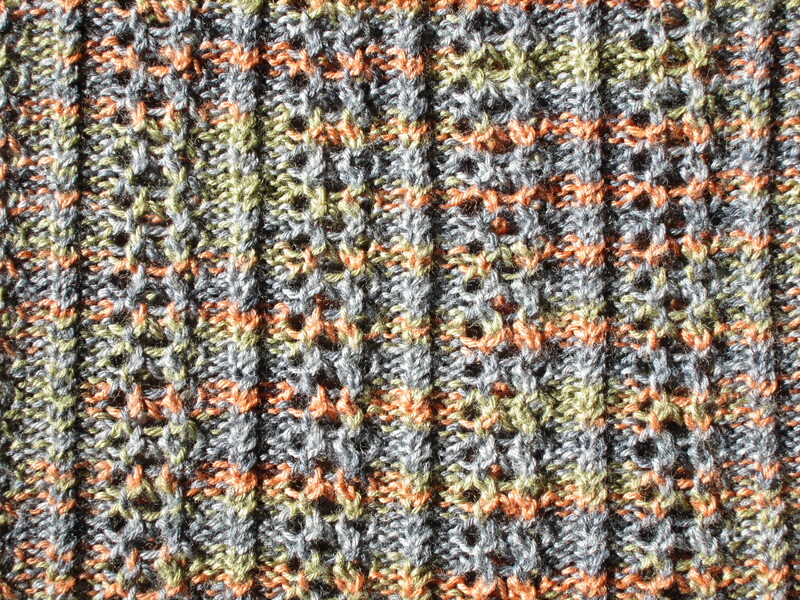 The resulting pattern is for an intermediate skill level (experience required), mainly due to the fact that the stitch count is not consistent from row to row. I’d love to hear what you think of this pattern or if you have any questions! 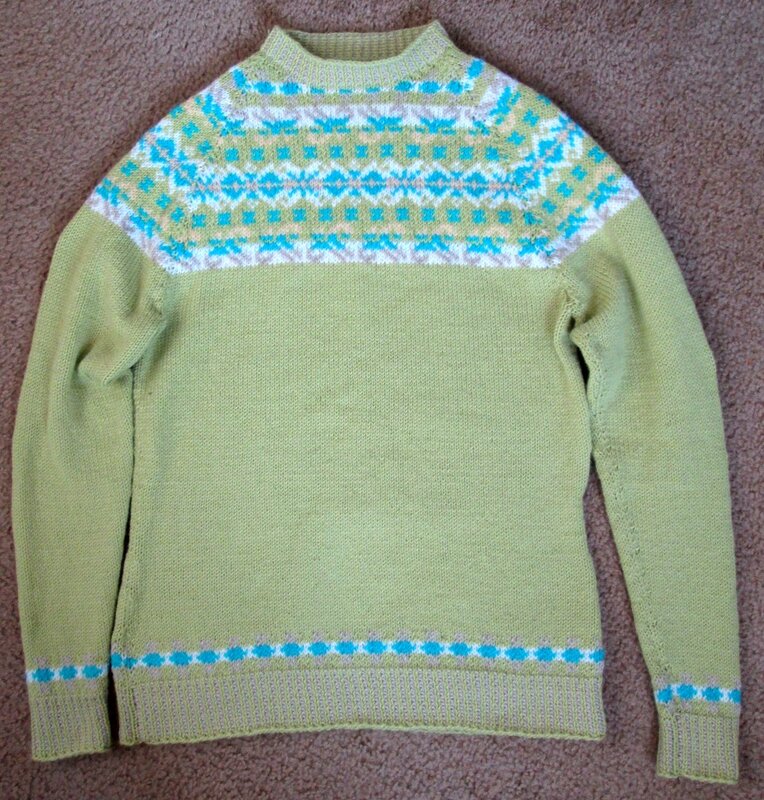 This entry was posted in knitting pattern, Uncategorized on May 24, 2013 by admin.